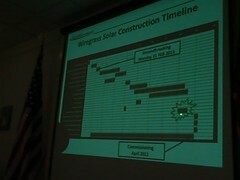 Last Saturday I heard Hannah Solar had completed the Wiregrass Solar plant installation in Valdosta. Today Col. Ricketts confirmed that. 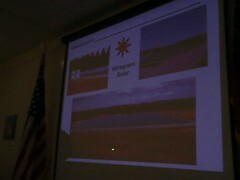 Congratulations, Industrial Authority, Wiregrass Solar LLC, and Hannah Solar! 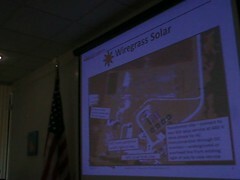 The first slide shows the location of the solar plant, which is in the back of Valdosta's Mud Creek Water Treatment Plant on Water Plant Road off of GA 94 (New Statenville Highway). Where there used to be just a bare field, it's now covered with solar panels. The current holdup is waiting for Georgia Power to connect the panels to the grid. After that, they just need to schedule a commissioning ceremony. Col. Ricketts said they'd discuss that "later". Allan Ricketts Program Manager, 15 March 2011. Video by John S. Quarterman for LAKE, the Lowndes Area Knowledge Exchange.